Earlier we went over how charcoal grills are becoming popular, like the Weber Performer Charcoal grill. But there are still quality electric grills, and there are ways to give it a charcoal feel to the grilling process. One of the best electric grills I’ve had the pleasure to use is the Meco 9325 Deluxe Electric Cart Grill with Rotisserie. Amazon has it for almost 50% off, as Meco 9359 deluxe grills are normally $294 but are $182 now with FREE SHIPPING for the summer. The first aspect of this grill that really stuck out was the lack of fire hazard and being very environment friendly. There is basically no smoke that comes out during the grilling process and because of the low fire risk, most apartments allow use of this Meco grill year round. The Meco 9325 grill may not cook with the flavor charcoal naturally, but adding something like hickory chips to smoke the food will give it that great taste. The cooking of meat is perfect, just start up the grill for 10-15 minutes to preheat. It is probably quicker to get going than a propane or charcoal grill, and you don’t need to waste gas or worry about having enough gas in the grill like a propane. The amazon Meco 9325W grill deal is probably the best deal on a Meco at just $182, though you may be interested in the Meco 4100 Model 4106 Square Utility Charcoal Grill, which is just $62. Yea I think these Meco grills will dominate the future with their eye towards limiting pollution and being able to be used in Apartments in major cities. Got my Meco Grill with free shipping! Just came in today…Thanks KPD and Amazon! Food tastes great and I saved a bunch of $. I love the Meco grills. I remove the grates when hot with vise grips and then put soaked wood chips on the element. It creates terrific smoke flavor. It does burn out the element once or twice a year but it still comes out costing less than charcoal and is better for you and more convenient! Great article and useful tips. Recommended for anyone wholove grilling like me Thanks! I purchased this grill and it was very good for the first 15 months. 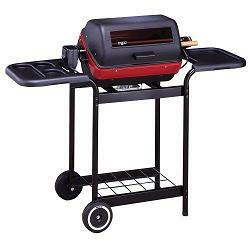 The grill rotates to be a rotisserie as well. I rotated the grill to the rotisserie and the grill shorted out and is now a door stop. The grill is only warranted for 12 months so if you want a grill for longer, look for a different manufacturer. I would not recommend MECO as a company. This thing is definitely decent overall. Maybe not the best ‘griller’ per se but it’s nice to have when you’re living at an apartment and cooks thoroughly and efficiently.